As we head into our second year, we take stock of our small handful of successes as well as the occasional failures. We’re coming to grips with one major setback and we’re trying to remedy it. Because we’re tribal in our devotion to the Caps, our fanaticism dictates slavish allegiance to them. It’s business and personal with us, but we sometimes lose sight of contributions that come from other teams and players; many of whom we should be thankful for, too. Sean Avery of the New York Rangers, deserves thanks as well – not for his rinksmanship – but for his dedication to the larger cause. He’s a Ranger after all, and an unapologetic prick on the ice, so of course our default is to dislike him. Blocked, we soul-searched (for about five minutes). We’ve put team rivalries aside, tempering our hatred for the Leafs and Flyers because of the Burkes. We thought we could make nice-nice – but no dice. We think he has ‘sensitive skin,’ and took our entreaty the wrong way, personally. We tried again. So much for catching more flies pests with honey than vinegar. Where does that leave us? Simple: In section 406 of Verizon on Friday as the Caps host the Rags. We’ll be the loud ones wearing red and chirping the crap out Sean and his band of Blueshirt misfits. We hold out hope, that in the spirit of the holidays, he unblocks and then follows. Will we be nice to him? Two chances – slim and fat; and fat just left town on a northbound for Pickering. We’ll also be very thankful to whoever can engineer the detente. 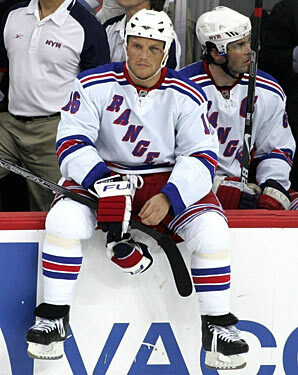 This could be another gay marriage initiative that Sean Avery can get behind. After all, it is legal in both New York and DC. Sean, will you gay marry us? 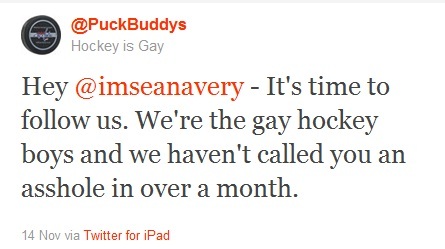 This entry was posted in New York Rangers and tagged Gay marriage, Sean Avery. Bookmark the permalink.